“We are not enemies, but friends. We must not be enemies. Though passion may have strained, it must not break our bonds of affection. The mystic chords of memory will swell when again touched, as surely they will be, by the better angels of our nature.” – Abraham Lincoln. Frans de Waal is a renowned primatologist and the author of several books positing the intelligence of mammals, including The Age of Empathy and The Bonobo and the Atheist: In Search of Humanism Among the Primates. De Waal points to the capacity of our own cats and dogs to be sensitive to the emotions of others. De Waal’s research fills me with hope for our species. It tells me that not only a chosen few “compassionate” people have inherited the capacity to be attuned to the emotions of others. 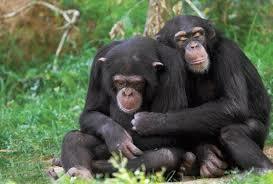 All humans, all of us as a collective species, have inherited the capacity to be sensitive to the emotions of others. His research also tells us we inherit from our mammalian ancestors the capacity for fairness, for compassion and for justice. Darwin himself even said animals showed signed for altruistic or moral tendencies, growing out of that capacity to feel. So as I look at my dog and her capacity for loving kindness, it brings me comfort that, fundamentally, beyond the reptile, under our “developed” pre-frontal cortex, we humans too have those angels of our better nature. Here’s to the angels of our better nature! I must appeal to them more often. 😀 Thank you Julia!